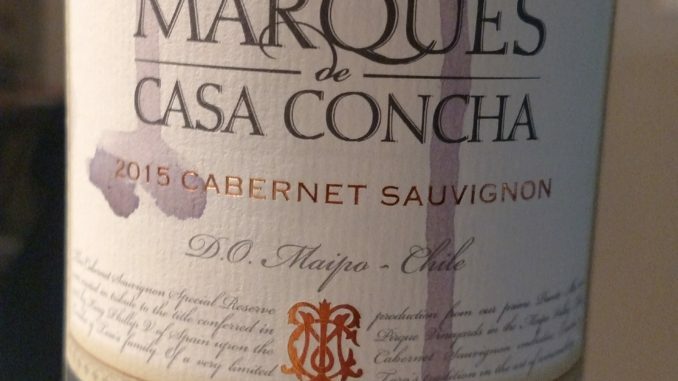 Winemaker’s Notes: Marques de Casa Concha is dark ruby red in color with luscious aromas of cherry and blackberries intertwined with cedar and smoke. These notes follow through to the palate. Tremendously concentrated flavors are revealed in firm tannins with a soft, silky texture and a lingering finish. My Review: And we’re on to Chile! If you’ve followed this site for a while you know that I like South American wine, and that from Chile in particular. I’ve had wines from Marques de Casa Concha in the past, but checking out a new vintage is always welcome. The 2015 Cabernet Sauvignon is deep red in color, and on the nose I picked up blackberries and cedar, both of which carried through to the palate. In the mouth the wine was dry, tart, and had a lingering finish. Starting out a bit hot, it’s definitely a wine to let open up (I know, patience). My wife and I paired the wine with some homemade chicken parmesan, and the dry, tart notes did a good job of pairing with the rich flavors of the chicken parmesan and the acid of the tomato sauce. At $25 I don’t know that it’s my best value, but it’s also not a terrible value. If you catch it on sale definitely grab it, but maybe wait for it to go on sale.